Break each matzo sheet into about 4 pieces. Lay the matzo pieces on two large cookie sheets that have been lined with aluminum foil. Heat the margarine and sugar in a small saucepan until bubbly, then add the vanilla. Using a pastry brush, generously coat the tops of each matzo with the heated margarine mixture. Bake in the oven for about 15 minutes so that the sugar melts and caramelizes. Watch to be sure it does not burn. While the matzo is in the oven, melt the chocolate in a double boiler over medium-low heat. Stir the chocolate with a rubber spatula as it melts. Do NOT leave unattended. Remove pan from heat before the chocolate is completely melted. (The heated chocolate will continue to melt as you stir.) Stir until soft and gooey. Remove the matzo pieces from oven. 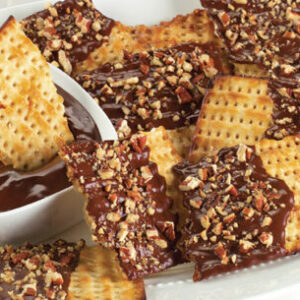 Dip each matzo piece into the melted chocolate. Lay flat and sprinkle lightly with the course kosher salt. If you like nuts, sprinkle with the toasted pecans.